Updated March 30: Diagrams, photos and the project description have been added. A report in the March TTC agenda recommends closing the Yonge line late at night for an extended period to speed up work on tunnel liner maintenance north of Eglinton. From June 2008 to February 2009, the line will be closed from Lawrence to Finch while work proceeds with the tunnel between York Mills and Sheppard. From March 2009 to July 2010, the line will be closed from Davisville to Sheppard (according to the report) while work proceeds from Eglinton to York Mills. The report is silent on whether a shuttle train would run between Sheppard and Finch. The hours of early closing would be from Sunday to Friday (Saturday late evening service would not be affected) starting at 12:30 am. The information here is based on the presentation made at the TTC meeting on March 26, 2008. 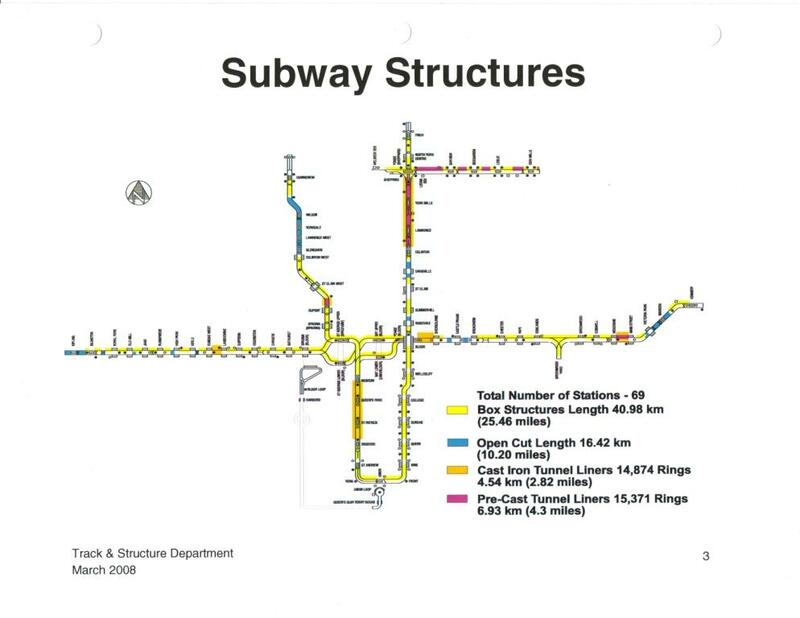 The subway system is built in several different ways ranging from open cut running, convention box structures constructed in an excavation, and circular bored tunnels. Some of the tunnel is lined with cast iron rings, and some with pre-cast, reinforced concrete rings. The pre-cast tunnel liners used on the Yonge Subway between Eglinton and Sheppard were the first pre-cast rings used for subway construction. They are showing their age and design shortcomings. Although the liner is 6 inches thick, at the bolt pockets it is much thinner at 2.25 inches. Liners used on the Sheppard subway are 8 inches thick and they are also larger so that fewer segments (and their associated joins) are needed. The problems had been masked for many years due to the presence of sprayed on acoustic treatment of asbestos and other coatings. 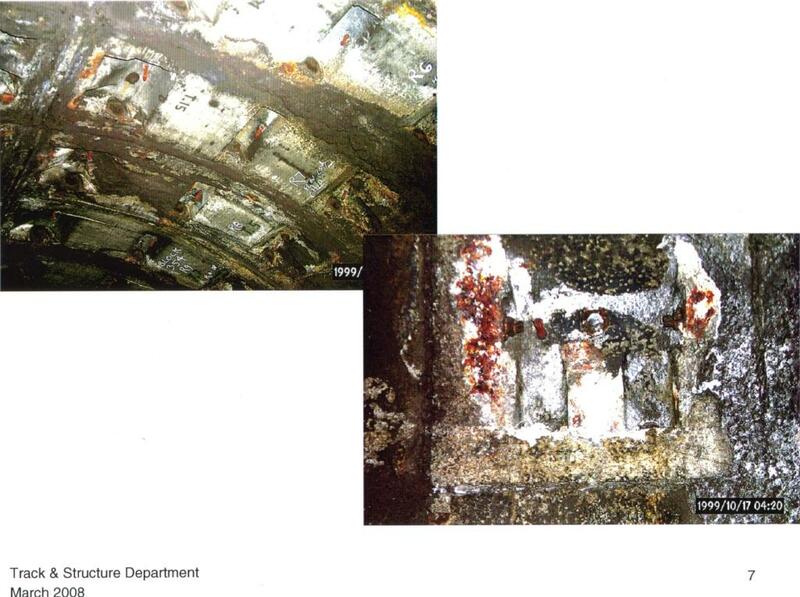 As this has been removed, the underlying condition of the tunnel was revealed. Examples of the problems can be seen in photos below. 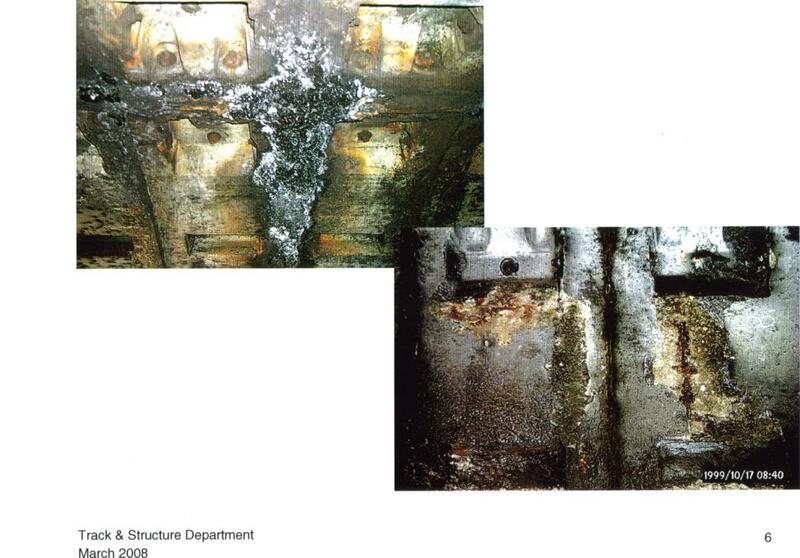 Both sets show the effects of corrosion and leakage between tunnel rings. “Squat” is caused by pressure of the earth above the tunnel forcing it slightly out of round so that it is now slightly oval. When tunnels are constructed, there is a deliberate over-safety factor built in to allow for deterioration over the life of the tunnel. However, the effects of pressure and leakage are different depending on the depth of the tunnel. Deep tunnels must withstand greater pressure, and so the safety factor “as built” is lower than shallow tunnels. However, the deep tunnels are below the transition between earth and clay (if you go down far enough, much of Toronto is a pre-glacial lakebed). The clay protects the deep tunnels from the chlorides (salts) that seep down from the road above. The thinnest parts of the liners are the pockets where the bolts holding the liners together. To reinforce these areas of the liners, they are first cleaned of scaled concrete and other corrosion damage. Holes are drilled into the sides of the pockets, a form is bolted over the pocket, and concrete is pumped into the space below. This concrete pushes into the holes to provide a solid anchor of the additional material with the existing liner. After the concrete has set, the sealant is applied. Core samples are taken to verify that the repaired liner is sound. 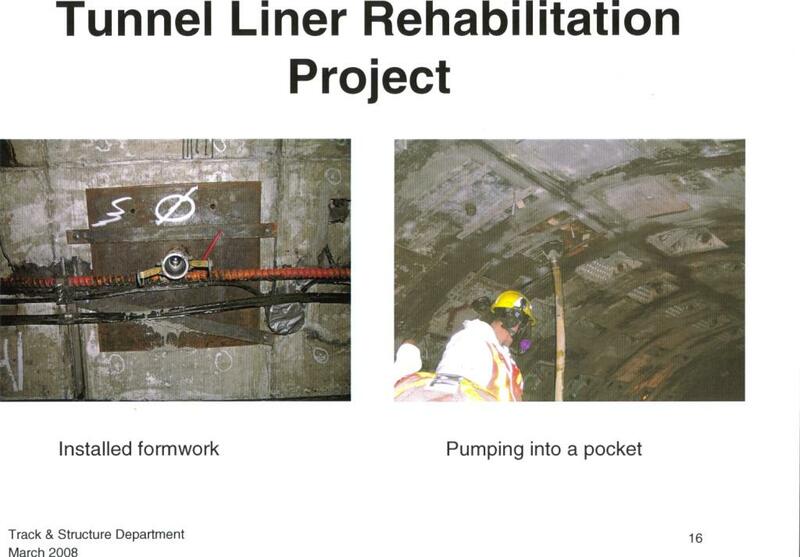 As of March 2008, the tunnel leaks have been plugged, although ongoing repairs are needed to stop new leaks as they arise. Removal of the sound insulation is about 1/3 complete, as is the filling of the bolt pockets. However, at the current rate of work, the project target end date of July 31, 2010 will not be met. This date is set to ensure that future deterioration does not compromise the tunnels. In the current work window, only 145 minutes per night are available for repairs. 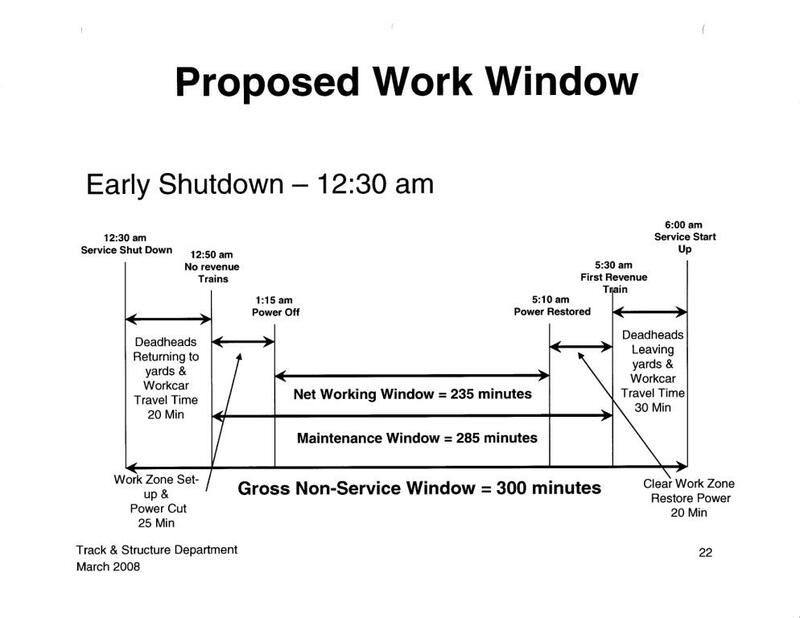 With the proposed early closing, the revised work window increases to 235 minutes. Overall, less time is lost to set up and tear down at the work site. 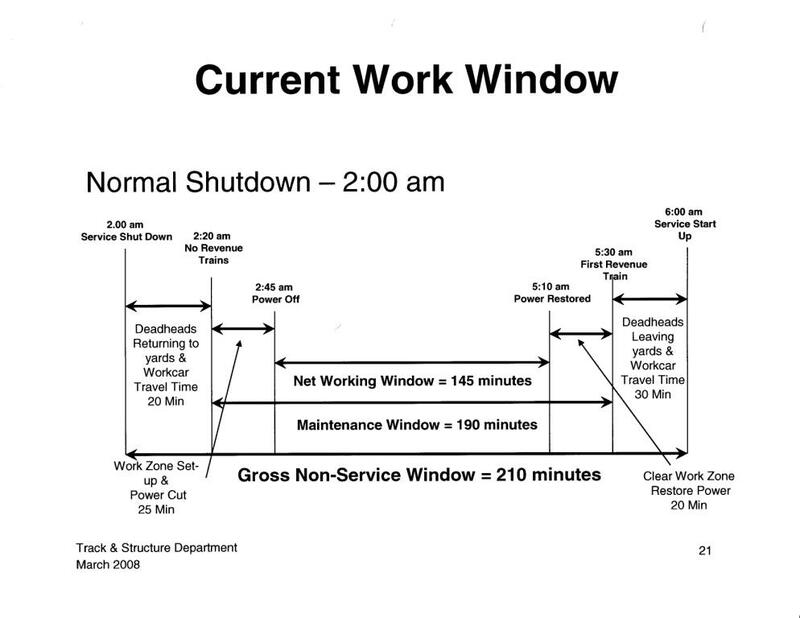 Although these diagrams show an overview of the night’s schedule, several crews are actually working in parallel at different locations on different stages of the project. One crew was recently added, and the TTC feels that this is the appropriate level for the project. There is more to gain from extending the work period than from simply putting more crews on the job. Late night ridership on the Yonge Subway north of Eglinton is 1,000 per hour or less, and this can be handled by bus shuttles at a small incremental project cost ($200K). There are many, many people who will be made quite unhappy by this. 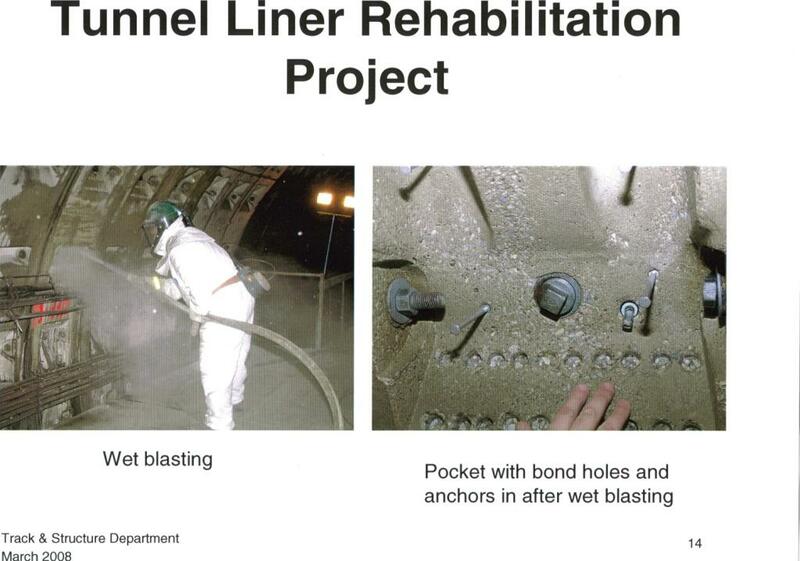 What exactly is the the “tunnel liner maintenance”? Will this have any effect on the southbound in-tunnel stops between York Mills and Lawrence, and Lawrence and Eglinton? Steve: The liners of the round tunnel wall have been deteriorating gradually since the line opened in 1972 and they need replacement/repair. As the TTC report says, if this work is not completed in the next few years, they could be forced to close the line. While I understand that this is an inconvenience to riders, it is clear that the TTC understands this and has moved to minimize this issue. After all, I cannot imagine many people riding the subway past midnight during the week – although I think the TTC needs to reconsider closing early on Friday night. I hope that people understand the consequences of this. If what Steve said is true and that foregoing the maintenance leads to a much less temporary closing of the line, the TTC is pursuing the right course of action. Did the SOGR funding cutbacks cause a delayed start to replacing tunnel liners or is this caused by a mis-estimate as to how long the work would take? Steve: According to the report, the work is taking longer than expected. Too bad the new signal system isn’t already in place, eh? What time does it close? Midnight? Well at least the TTC is thinking in terms of the long term for once. I’d rather them do this now than have to shut down the entire line later for an even longer period of time. They should shut down the Sheppard subway while they are at it. A bus every 10 mins would fill the gap, and that’s very sad. Why work on sections in series? Your post says that work will be done from York Mills to Sheppard first and then from Davisville to Sheppard second. Can they not have multiple crews work on the two sections concurrently (and thus minimize the disruption period)? Steve: I suspect that there is a special work train used for this project, and it can only be in one place at a time. Hopefully while the line’s closed from Eglinton on north and trains are reversing at Davisville, the TTC will fix the cause of the slow zone on the southbound track, just north of Davisville. That slow zone’s been there for almost a year now and I can’t recall any other track defect persisting this long without repair. Steve: Replacement of the special work north of Davisville is in the 2008 Capital plan. I agree that this is a ridiculously long time for a slow order on a major route. This is the sort of thing that will do in any attempt to increase capacity by running more frequent service. Steve: I suspect the biggest problem lies in the track layout and the absence of two-way signalling. For a Finch-bound train to use the S-E curve, it would have to drive the wrong way through this curve to reach the Yonge line. It would actually make more sense to come straight through Sheppard-Yonge Station, reverse over the S-W curve (which is signalled for that direction of travel), then north across Sheppard crossover into the station. Conversely, trains bound from Finch to Don Mills would come south through Sheppard, across the crossover, then turn east onto the Sheppard line. Note that there would be no eastbound service from Sheppard-Yonge Station. All of this is a rather convoluted way of running service when all that’s really needed is one or two trains shuttling back and forth from Sheppard to Finch for the level of demand at that hour. Note that there is a subway track map in this post now. If they where to leave train sevice operating between Sheppard and Finch, would than mean that a train or two would have to be left there overnight? Any problems with that? Steve: It is common to leave trains parked on the line overnight during snowstorms in case of problems in the yards the next morning. In terms of the bus replacement, would it be logical to have artics for a change? Pad some surge ridership, which is becoming more regular every day it seems. Steve: For this project, if they were here, yes, but ridership north of Eglinton after 12:30 is not exactly packed to the doors. The TTC is considering artics as part of the next round of bus purchases, but they need vehicles that are reliable and lasting, not junk heaps that last half the life of a regular bus. At the Commission meeting Vice-Chair Joe Mihevc asked the question of TTC staff “Why not double the crew to get the work down sooner” (still in extended window) and Warren Bartram the General Superintendent answered there are already 5? crews~(associated with one work car? or work site? )… they’ve added one additional crew (to 6? doing prep tasks but it didn’t result in much of a productivity increase and he added their wouldn’t be much more productivity adding a 7th crew. I don’t think Warren’s literal response answered what Vice-Chair Mihevc really meant to ask: Would a totally separate crew/work car working concurrently at a different tunnel location to halve the time to complete the tunnel liner remediation work? It’s an example where TTC Commissioners acting part-time, meeting monthly are at a tremendous disadvantage when asking full time long-tenured Staff (often Engineers, questions, many of a technical, engineering, or operations nature that require much expertise and experience to cross exam effectively. Most Commissioners (Vice-Chair Mihevc excluded~ his TTC service dates to 1998) have served a term (18 months-3 years, now 2-4 years) or less on Commission and are still virtual rookies learning the ropes on a very complex and technical appointment. So if Vice-Chair Mihevc (whose father worked 32 years as a TTC mechanic) and has sat on the Commission off and on since 1998 can’t get a satisfactory answer~that he has confidence in… what hope is there for transparent answers asked by less experienced Commissioners? The Commissioners ask a question, get a simple or sometimes evasive answer to bolster the Staff recommendation and they have neither the time, knowledge, or desire to dig deeper… so Staff usually get their own way under the guise of safety, security or low cost as they see fit; despite the nominal political oversight. Work cars are simply decommissioned subway cars that are stripped as needed and rebuilt in TTC subway yards for the specific task (asbestos removal, tunnel liner work, washing, etc.) It is a simple and relatively inexpensive matter to build another workcar… something the TTC takes great pride in engineering and building onsite. p.s. One issue that didn’t get any consideration was whether the TTC should keep existing subway hours Saturday AND Friday nights… given the heavy downtown entertainment, shopping, dining crowd downtown that will be majorly inconvenienced with early Friday shutdowns. The TTC often schedules maintenace to be primarily convenient and low cost to them and their budget (which they excel at)… but customer considerations are sometimes a distant second consideration, if at all. p.p.s. I couldn’t help but wonder if the Crown Deformation (making circular tunnel flatten, more egg-shape) may have been responsible for the tragic accident where an asbestos work car platform snagged a cable which hurled it against the trailing work car cab, killing its driver. Steve: The amount of deformation was very small, and if anything would have made the tunnel very slightly wider at the point where the cable was snagged, I believe. Considering all the methods of tunnel construction present throughout the system one has to wonder which method will prove to be the most durable. Cut and cover is what the B/D line is constructed off almost entirely. But cut and cover sits at such a shallow depth (in most cases just a few meters bellow the road if I’m not mistaken). 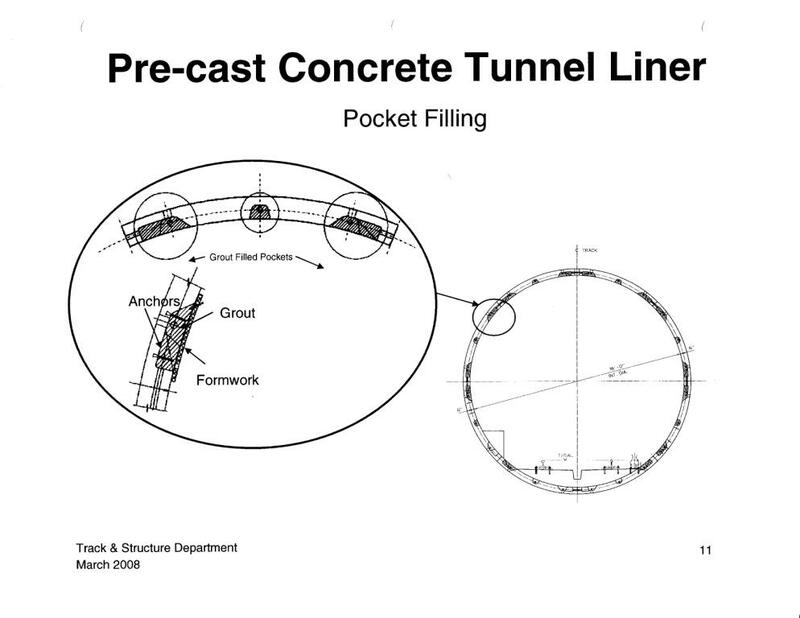 That cut and cover would sustain far more deterioration over time then the bored tunnel method. Also I’m going to take a guess that the new reinforced concrete tunnel liners will hold up much better then there cast iron predecessors. In the grand scheme of things building materials don’t last forever. 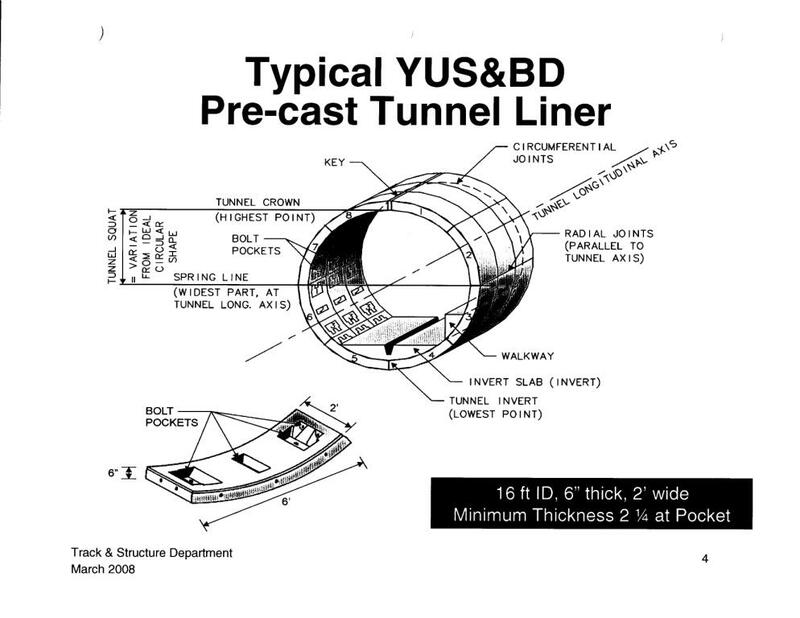 Considering those tunnel liners on the Yonge line are now nearly 60 years old. And have never really been given any preventive maintenance over that 60 years until now. I would say they held up fairly well. But it would seem the majority of cities prefer bored tunnels to cut and cover, the main reason of course is tunneling has limited impact on the surface. The B/D line should be showing its age soon enough so I guess time will only tell. Steve: The bored tunnels on BD and University use cast iron liners and these seem to be holding up well. The biggest problem for all types of construction is leaking water. At many places along BD, there are station ceilings that have broken up badly, typically at joins between sections of the concrete. For example, my home station Broadview has had ceiling repairs underway for some time. There is a lot of groundwater around the station from old streams. There was complete, utter chaos on the subway tonight Mon, Oct 13, 2008 12:45 AM, due to early closure. The shuttle-bus drivers did not know if the subway was open. There were NO SIGNS, no info. I had a bicycle to take on the subway, but without any notice, the subway closed early. Why wasn’t the general public informed? Worse, the TTC website still says the subway runs until 1:15, when it closes at 12:30. I checked this today before I travelled. It looks like its been closing early for months, and the website still has false information? That’s nuts. Literally hundreds of people were completely confused and ticked off due to this. And there was NO INFORMATION. No one knew anything. Even the subway booths were empty at Lawrence, and the gates wide open at 1:15 am. There was no one in the subway booth. Why end the subway 30 minutes early, and mess up the entire city? It makes no sense at all. Lots of people take the subway late at night for work, some even have a bicycle, and a heavy backpack. This is the kind of thing that kills the TTC. Steve: You are correct. This early closure has been going on for months (and will continue for quite a while) and there is NOTHING on the TTC’s website to tell people about this. Nothing on the Subway page. Nothing on the construction projects page. We had signs everywhere telling about the early closing of the Sheppard line for signal testing, but there are few signs advising people that the Yonge line shuts down late at night six days out of seven. It is now May 20, 2011 and this is still going on. The closure has been north of Eglington to Finch for over a year now. Are they twiddling their thumbs down there or what? I find it hard to believe that no progress has been made in that time. If this is the amount of time it takes for tunnel maintenance, just imagine how long legitimate subway expansion will take. I’ve had enough of this union sloth, we’re going to have to privatize the TTC before anything gets done. 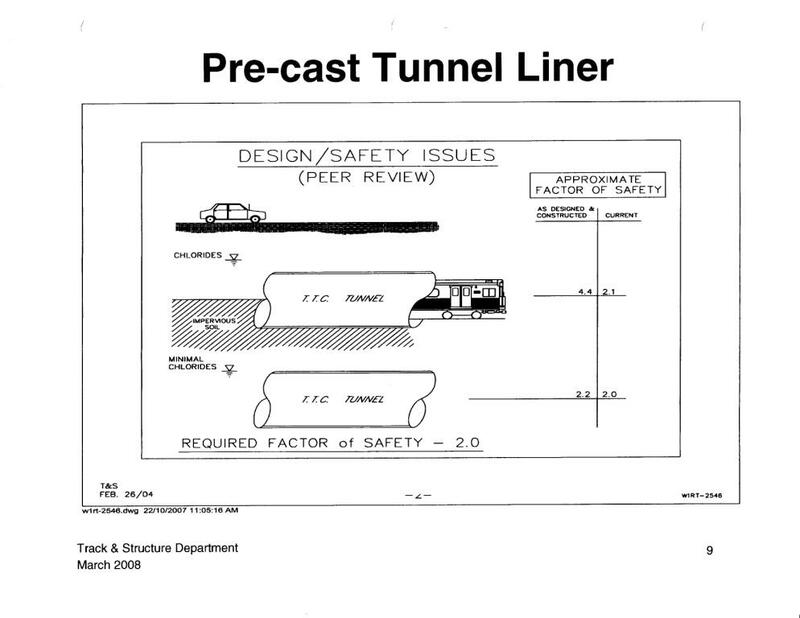 Steve: In case you have not been paying attention, the problem is that the tunnel north of Eglinton is being pushed out of round due to a design flaw when it was built 40 years ago. The repairs have included strengthening the tunnel so that it will not deform further, and this work is taking longer than expected. They are working south toward Eglinton, and so service north of there late at night won’t resume until the project is completed. The time extension on the project was announced last year. It’s so nice to see how uninformed comment automatically assumes that the problems are unions and public sector management. Maybe you should have complained about the non-union engineers who were responsible for the bad design in the first place, or the private sector company that built the tunnel. I don’t shirk from criticizing the TTC when they deserve it, but attempt to have my observations rooted substantially in fact. I also do not hide behind an email persona on a generic public provider like gmail. Any idea where they are working on the line at the moment and in which direction they are heading towards? Steve: Somewhere south of Lawrence and headed south to Eglinton.